Lisa Murkowski (born May 22, 1957) is an American politician. She is a member of the U.S. Republican Party. On December 20, 2002, she became a United States Senator from Alaska. In 2009, she became the senior senator from Alaska. She was in the Alaska House of Representatives from 1999 to 2002. 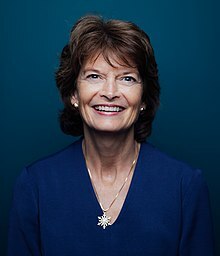 Murkowski was born on May 22, 1957 in Ketchikan, Alaska. She studied at Georgetown University and at Willamette University. She is married to Verne Martell. They have two children. ↑ "Murkowski, Lisa". Office of Art and Archives and Office of the Historian, The United States Congress. Retrieved July 15, 2015. This page was last changed on 17 September 2018, at 03:56.